Carriers-locked phones are a Pain in the matter regarding of software updates, Not if you own a Nexus smartphone. 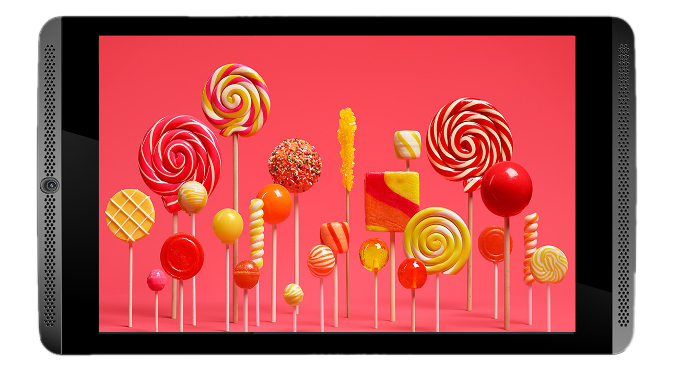 Google has just release Android 5.1 Lollipop and updates the unlocked Nexus 6 users around the world, its turn for the carrier's version. 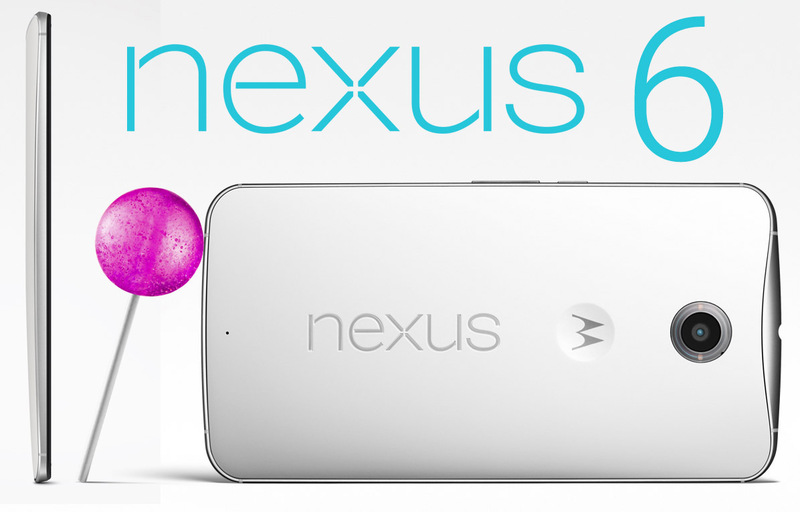 Now, AT&T customers with the Nexus 6 have started to see the update offered to their device. Carrying build number LMY47D, the same build that is currently being pushed out to the Nexus 5. The Update carries many bug fixes and performance enhancements. As had been predicted by a leaked piece of information known as the Samsung Nougat "roadmap" quite a while back, the Tab S2 has just started to receive Android Nougat 7.0 via OTA updates in the United States. 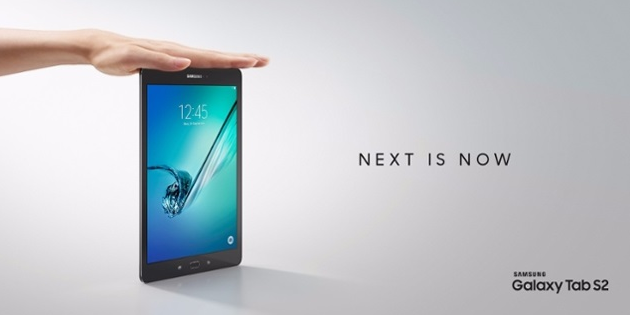 Model number SM-T713 was released back in the November of 2015, so it's good to see that Samsung is still supporting the tablet with the latest Android OS update. It might not be the most timely update ever, but Samsung isn't known for that either! 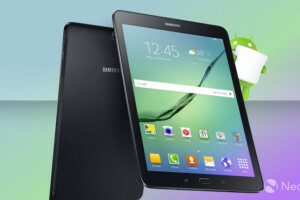 Firmware version T713XXU2BQD3 will be making its way onto your Galaxy Tab S2 8.0 tablets in the US anytime now, if it hasn't already. Check from the Software Updates section, but it isn't really necessary though, given the fact that you will be prompted automatically to update your phone as soon as it arrives. The source of the news also reports that the update will not enable the Always On display functionality on the tablet, in spite of the device sporting a perfectly capable AMOLED panel. I guess they consider the feature to be a smartphone exclusive for now. It was both surprising and disappointing to see the Galaxy A3 (2017) being released by Samsung without Android 7.0 Nougat onboard. 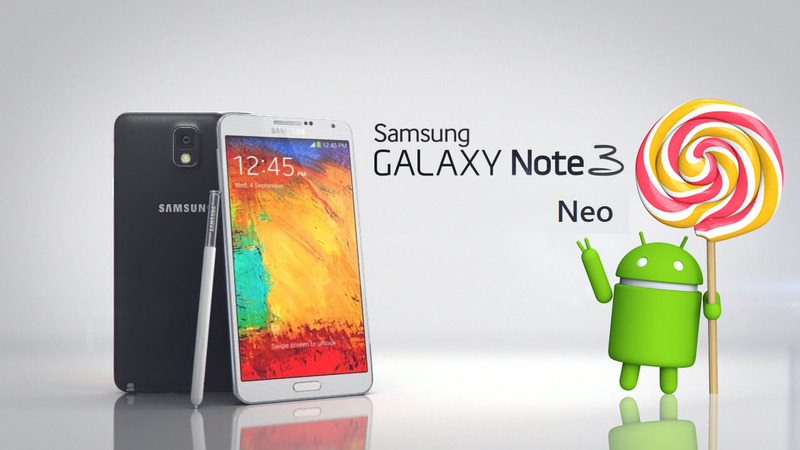 However, it also meant that the phone would soon be receiving the update from Samsung. 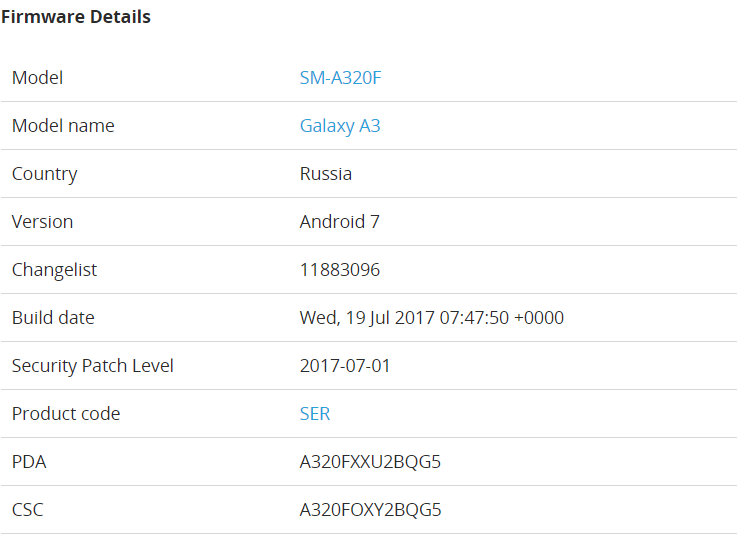 Although it can't exactly be called soon anymore, in case you bought the device, you should be glad to hear that Nougat is currently being rolled out to the A3 (2017) SM-A320F in Russia as you read this. Given that the update had started rounds back on the 26th of this month, you probably have already received a notification to update your device to the latest (released) Android OS, provide you are in Russia. If you haven't, don't worry, sometimes it takes a few days before all the batches are rolled out in an area. If you are in any other country however, the same update should be released in your region very soon as well. It's a massive OTA package of 2.21GB by the way, so you better have a good Wi-Fi connection! 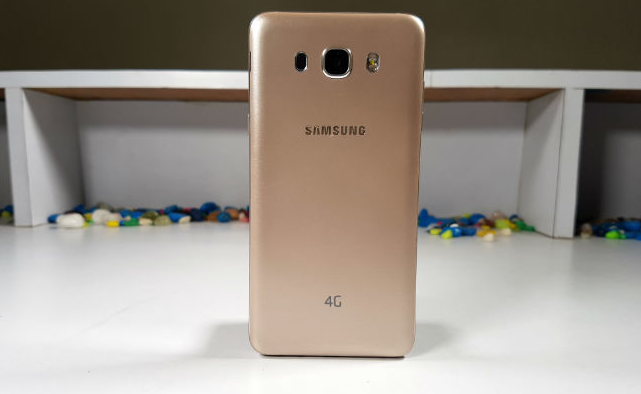 It carries the firmware version A320FXXU2BQG5 and brings the July security update for the device from Google and Samsung. Take a look at the screenshot below for more details. 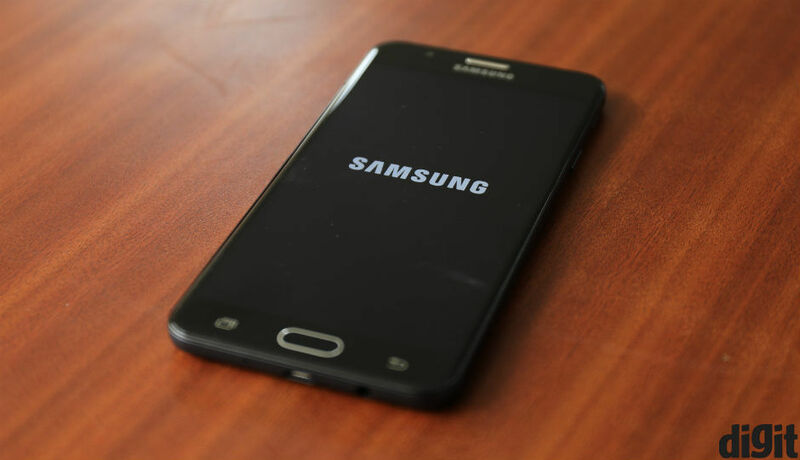 A lot of people expected the Galaxy A 2017 series to come with Android N preloaded but that didn't happen, as Samsung wasn't ready with the firmware in time. However, it did mean that Samsung would be updating the OS from Marshmallow 6.0.1 to Nougat 7.0 very soon. 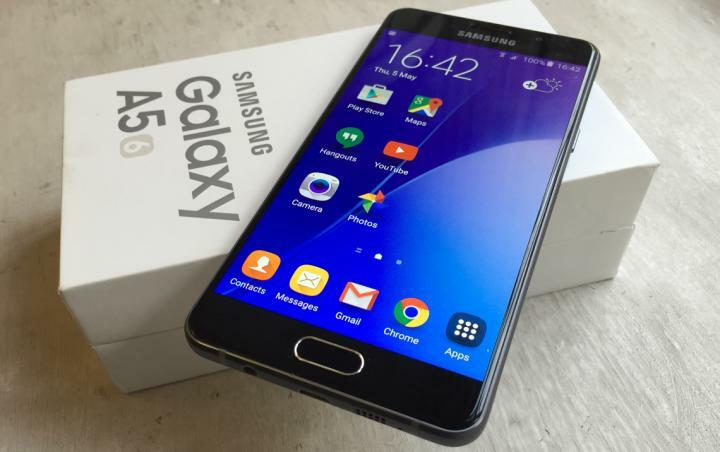 The good news is that it is finally happening as the OEM has just started to roll out the Android OS upgrade package to the Galaxy A7 (2017). Although it can hardly be called a "fast" update at this point, let's just be glad that it's finally here. 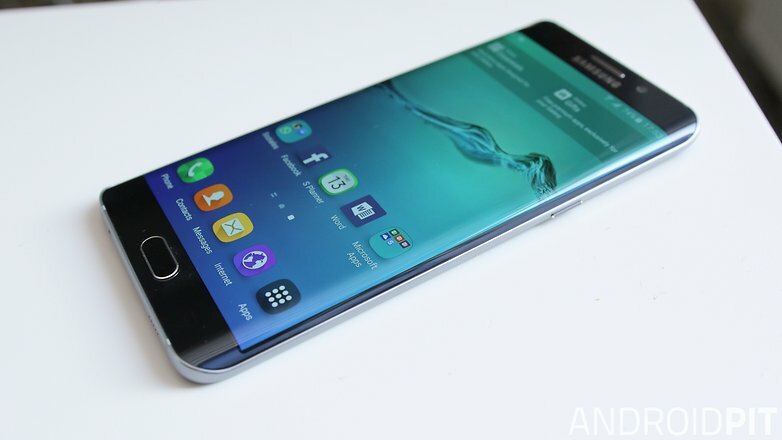 As of now, reports from Thailand indicate that Samsung has probably released the update first in that region. Nevertheless, other countries should also begin to see the OTA upgrade package arrive in the coming weeks. 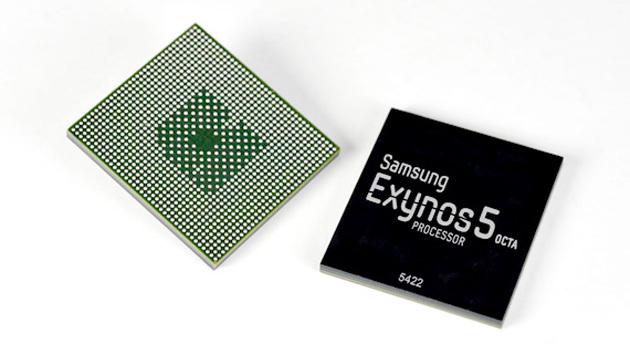 Firmware version of the package is A720FXXU2BQGB and it comes in quite a hefty size of 1394.40MB. If you see the update for your Galaxy A7 (2017) and you do not live in Thailand, do let us know in the comments. Thanks! 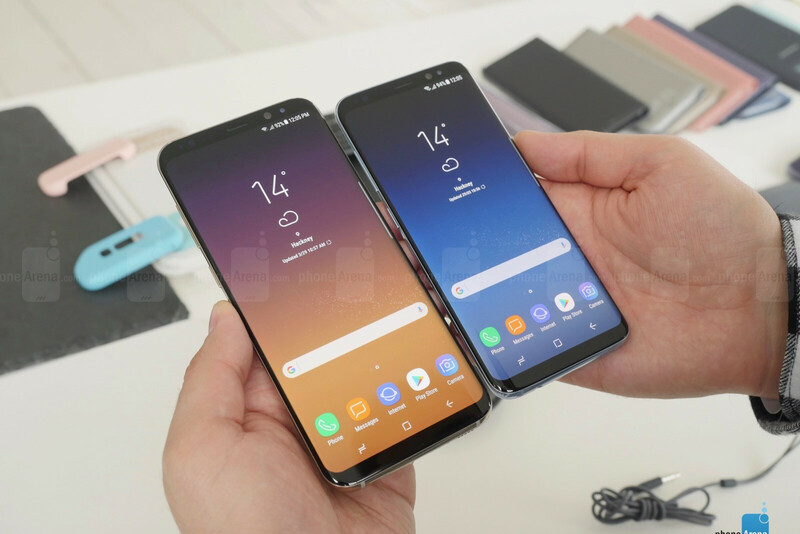 Although the Galaxy S8 and S8 Plus are usually the first ones to receive the latest security patches from Samsung, they were beaten to the August security patch by the Galaxy J7 Prime this month. 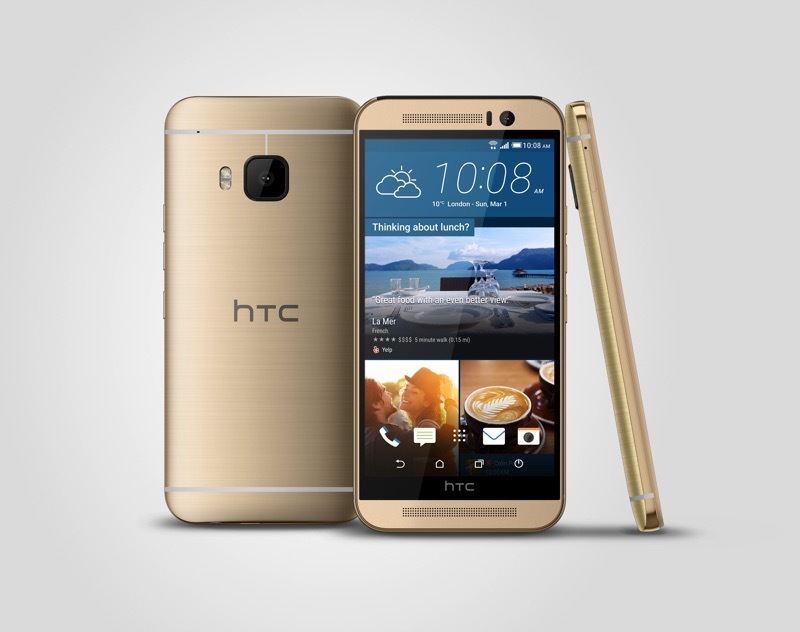 Nevertheless, the two flagship handsets have now started to receive the August SMR from the OEM yesterday. 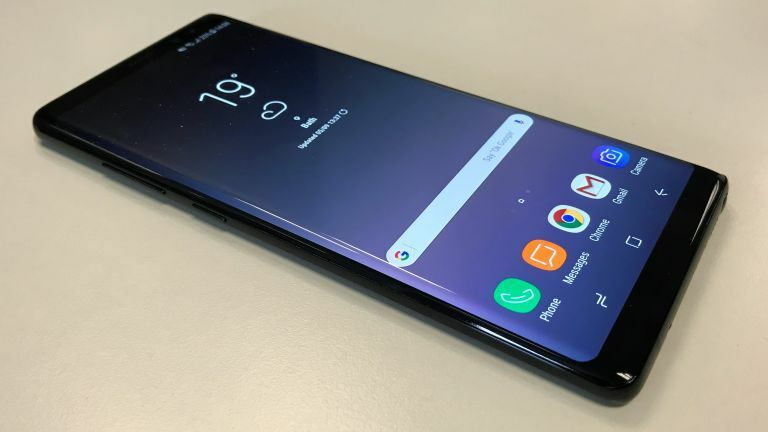 As of now, SamMobile Reports that only UAE, Turkey and Germany are receiving the update, but it's only a matter of days before Samsung's respective departments in every other region also starts sending out the same update via OTA to the S8 and S8 Plus. The August patch is a really heavy one at 600.35 MB, so you better fire up your Wi-Fi before downloading this one. You can check out the firmware version and other change details in the screenshot above if you want. Just like all other security patches from Samsung, this one also has 12 of Samsung's own fixes and patches for its own overlaying UI, in addition to the 28 Common Vulnerabilities and Exposures present in the base Android OS. At this point, the Android Nougat 7.0 OS is more than a year old, but thanks to the very botched up update system which most Android smartphone users must deal with, users are just glad to hear about the year-old update finally arriving on their smartphone model. 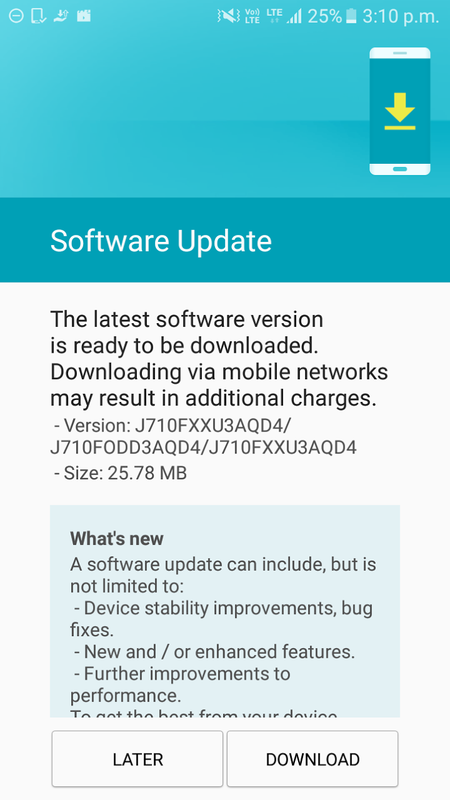 While Samsung has most definitely stepped up their game recently by providing updates that are much more timely than they used to be a few years ago, they still take a long time to release major OS upgrades for all their models. 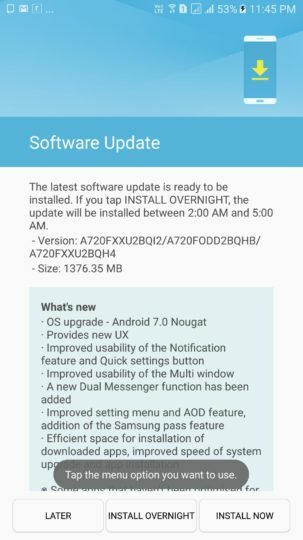 Having said all that, we have good news for you if you live in India and you own a Galaxy A7 (2017); the much awaited Android Nougat 7.0 update is now live via OTA. Firmware version A720FXXU2BQI2 is rolling out to model number SM-A720F throughout the entire Indian subcontinent. It's a huge update of 1376.35MB, so do not forget to plug in your Wi-Fi or it will drain your mobile data in a flash. Some of the other improvements that come with the firmware (aside from the default ones which will come with all Nougat updates) include the following. 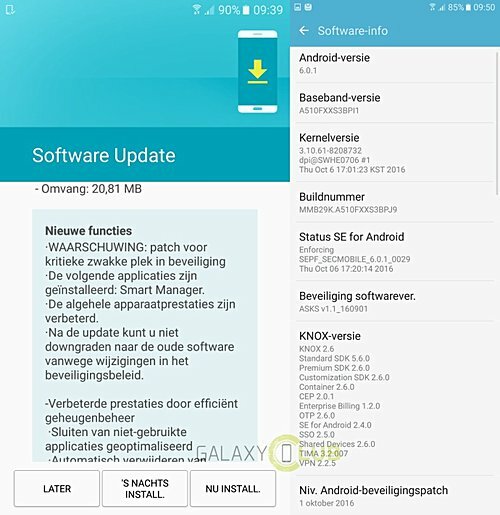 Samsung has not exactly been very orderly with their updates recently and if their schedule for rolling out last month's security patch is any sign of things to come, then the company might be reverting back to their old infamous routine where they released security patches and Android updates later than a top tier manufacturer should. Nevertheless, you should check your Galaxy S8 and S8+ if you live in India for the October security patch because starting 13 November, it did start rolling out to the two models in the region. Firmware version for the update is G955FXXU1AQJ5 for the Galaxy S8+ and G950FXXU1AQJ5 for the Galaxy S8. Both are exactly 492.74MB in size so get ready to hook it up to your Wi-Fi! This delay comes in right after Samsung decided to skip the September security patch altogether. Although it's worth remembering that they did patch the BlueBorne security threat in time, which was probably the reason why they could not release the September security patch. Nevertheless, that still doesn't explain why Samsung's flagship handsets are receiving the October patch in the middle of November! Samsung might have messed up their scheduled security updates quite a bit ever since the BlueBorne threat was detected, but they are getting back on track now. They have started releasing the November security patch for multiple devices in various regions. 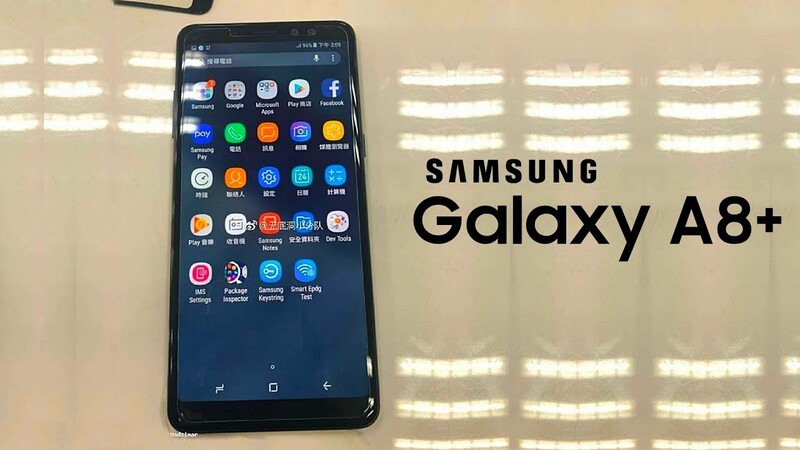 If you happen to own a Galaxy A7 (2017) in India, then you will likely be prompted to update your phone any time now, if you have not been prompted to do so already. Check out the software update section manually to know for sure. If the update is not there yet, don't worry about it because it's only a matter of time. The update comes in at a decently heavy size of 330MB, via firmware version A720FXXU2BQK2. 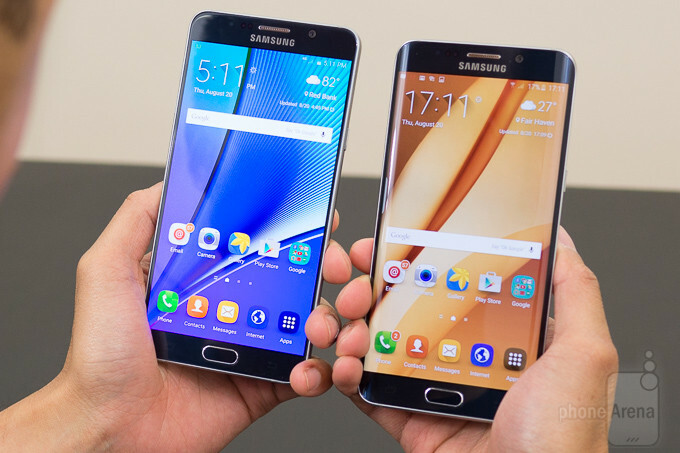 It includes fixes for 61 vulnerabilities in the base Android OS and 6 in Samsung's own overlying UI. There's also a patch for the KRACK Wi-Fi vulnerability included, in case you are wondering. 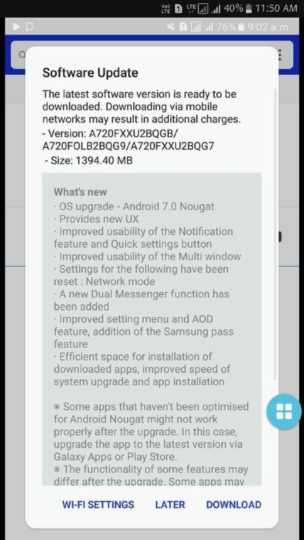 Although the exact details were not shared by SamMobile, we are guessing this update also patches the BlueBorne threat on the A7 (2017), given that this is the first firmware update that the smartphone is receiving in the region since it got updated to Android Nougat. We have almost reached the end of the third week of January, so it's about time that Samsung's 2017 flagship handsets got updated with this month's patch and thankfully, those updates are finally here. 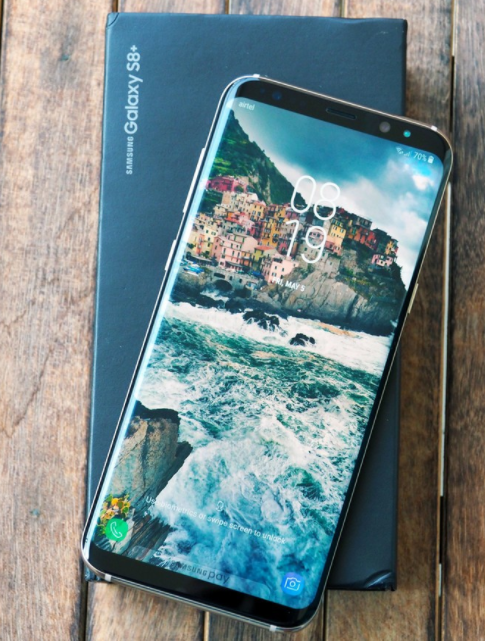 Firmware version G9500ZCU2AQL2 and G9550ZCU2AQL2 are rolling out for the Galaxy S8 and S8+ as you read this, but unfortunately, that's happening only in China right now. Nevertheless, it's definitely a sign that the January security updates are heading for the two flagship handsets from 2017 in all other regions soon. 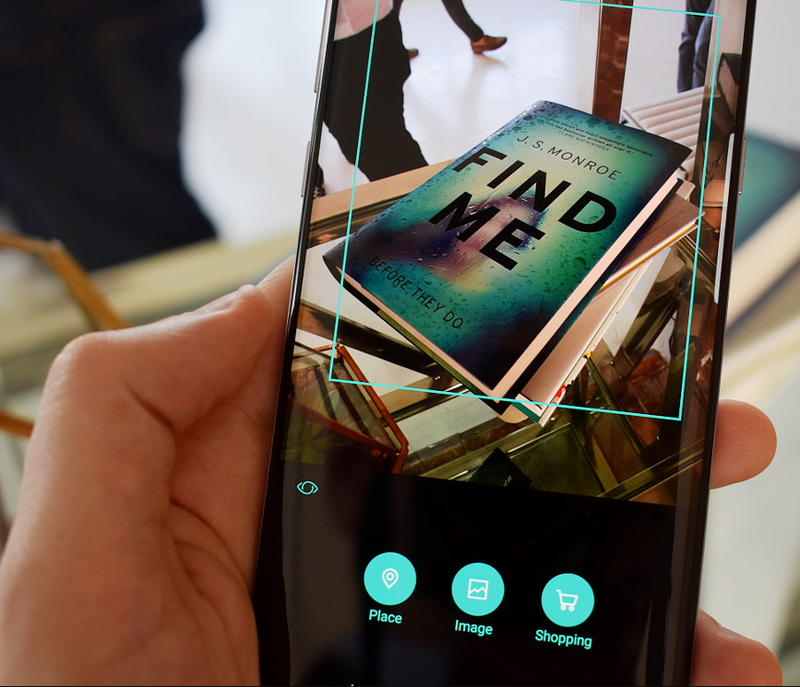 Another of Samsung's high-end handsets is getting the same update and it's good news for our Indian fans because that's where it is rolling out for the recently released Galaxy A8+. 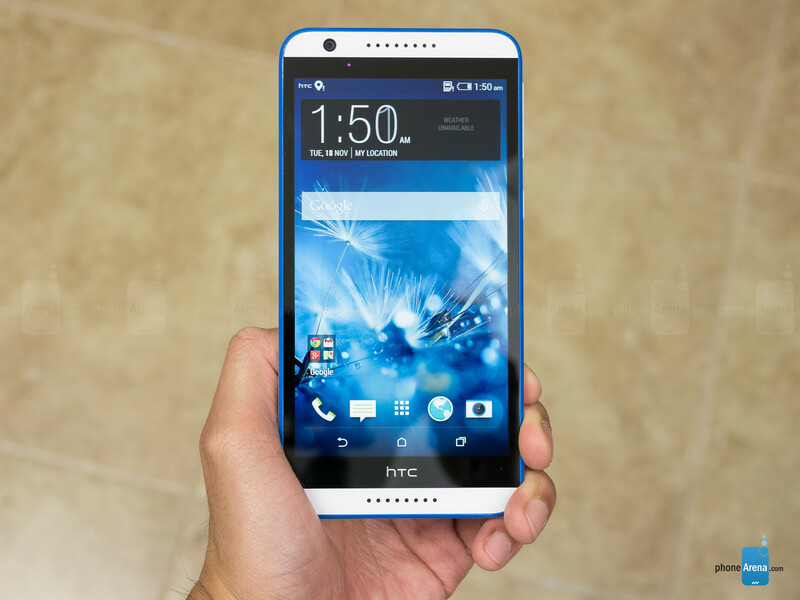 The update itself is moderately sized at 220MB and carries the firmware version A730FXXU1ARA6. Both the patches will carry all the fixes that the January patch from Google is supposed to bring, in addition to fixing 13 bugs in Samsung's own UI. Hurry up and download it as soon as you are prompted to by your device.